Jungle Wild, made by WMS gaming, incorporates a lot of the features of the G+ range of slots. So, you get amazing graphics and sounds, and gameplay that is really absorbing, including a free spin bonus rounds. The Jungle Wild game is one of the most popular G+ games, so we hope you enjoy our free version. Inspired by the flora and fauna of the jungle, the Jungle Wild slot by WMS Gaming is colourful and vibrant. It is a 5-reel, 30-line video slot with a compelling range of symbols and a generous free spins feature. The graphic quality may not be as pristine as it is in some today’s slots, but Jungle Wilds stands the test of time and finds its audience without a problem thanks to the exotic theme and stacked Wilds during free spins. At first sight, Jungle Wild attracts with lovely symbols. They were indeed impressive at the time when the slot was released, but have now been matched and surpassed by some of the more recent online slot6 releases. The backdrop of a lush, green jungle rounds up the theme and makes a great framework for symbols such as monkeys, parrots and butterflies, as well as different kinds of exotic flowers which pay less than animal icons. You can also see two tribal masks, possibly originating from ancient Mayan culture. These, alongside the game logo Wilds offer the highest payouts. There is also a Feature symbol (bonus symbol) which is represented by a golden Mayan temple located deep into the jungle. The dashboard is below the reels and shows regular WMS controls: Spin button, Autospin, Paytable, +/- for active lines and +/- for the bet per line value. Base game is seasoned with a rewarding free spins round and an intricate feature referred to as the ‘bonus guarantee’. It takes at least 3 of the temple Feature symbols to initiate the freebies, but if you manage to do it with 4 or 5 of them the reward is bigger. For 3 temples, the player receives no more than 5 freebies; for 4 of the temple symbols the reward is 7 free spins, and for the maximum of 5 the reward is 20 free spins. The round can be re-triggered and 5 more gratis spins will be added on top of the initially won number. According to estimates, between 50 and 100 spins are needed to start the freebies round in Jungle Wild. The main thing to remember is that on every free spin there will be two random reels converted into Wilds. The so-called ‘bonus guarantee’ happens when players place wagers at maximum paylines. This option becomes the most lucrative during free spins when the player wins 300x the line bet, guaranteed. Even if you play with fewer active lines, there is still the possibility of receive the ‘bonus mystery kicker’ aka a 2x, 5x or 10x multiplier at the end of free spins. 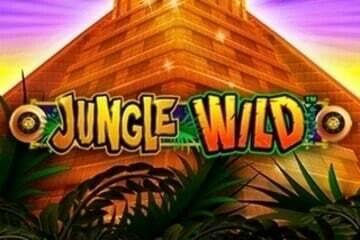 Jungle Wild is a fairly simple slot, but it has undeniable class and a flattering winning potential. Some like to say it’s underrated. WMS nature/ancient culture video slot has a 95.95% RTP and a max payout of 2,500x the bet. The volatility is within the medium-high range. As you’re spinning the reels of Jungle Wild think about this: there actually is a fair chance you might stumble upon some ancient Mayan gold. Who wouldn’t want that in their life? The real money version is in all casinos, as you would expect, but online it is a different story. You can play the free (no cash) game here, but if you want to gamble online playing this particular game, you might be disappointed. Current licensing restrictions mean that the game is off-limits for players in the US and Canada. You can play if you are in the UK, for actual monetary jackpots. But that is no consolation if you are living in North America. At least you can play here, or go visit your local casino, or even use it as an excuse to visit Sin City!